Earlier this week, Venezuelan President Nicolas Maduro called Washington's decision to send humanitarian relief to the crisis-struck South American country a "political stunt" and a pretext for invasion. The US plans to vote for a UN Security Council (UNSC) resolution which voices "deep concern" about the humanitarian situation in Venezuela, including "recent attempts to block the delivery of humanitarian aid", Bloomberg reports. According to a copy of the document obtained by Bloomberg, the resolution also calls for the "immediate start of a political process leading to free, fair, and credible presidential elections" in Venezuela. The document also accuses Maduro's government of causing "an economic collapse" in the Latin American country, which has prompted millions of refugees and migrants to leave Venezuela "in search of food, basic medicines, and opportunities in other countries in the region". For the resolution to pass, it needs nine votes in favour and no votes in opposition from any of the five permanent UNSC members, including Russia, the US, the UK, France and China. Earlier on Sunday, a diplomatic source told Sputnik that Russia has prepared its own draft UN Security Council resolution "in support of Venezuela". On Saturday, the AP news agency reported that US trucks full of food and medicine have arrived at the Venezuelan border near the Colombian city of Cucuta. 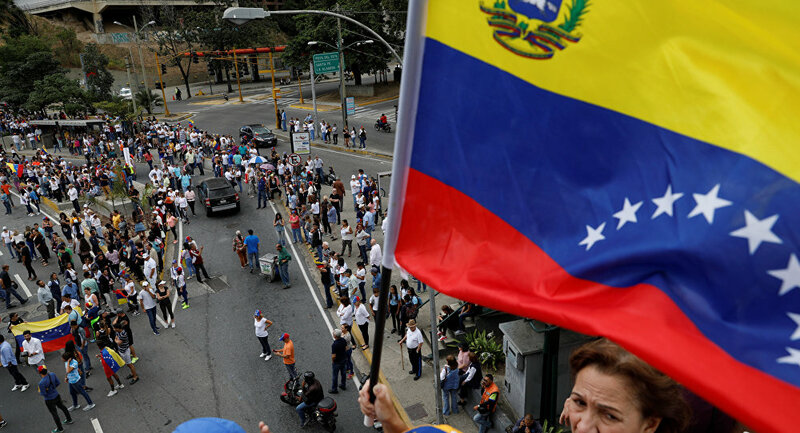 However, the Venezuelan military reportedly blocked the Tienditas bridge so that the trucks cannot enter Venezuela. The BBC cited Venezuelan President Nicolas Maduro as saying that his country has "never been, nor are we, a country of beggars". He also insisted that the US had declared a humanitarian crisis in Venezuela to create "a cover for the military plans of the Trump government". "The whole crisis in Venezuela is that the United States imposed sanctions and imposed a financial blockade", Maduro stated. He was echoed by Venezuelan Vice President Delcy Rodriguez, who argued in an interview with RT that "this [humanitarian assistance] is a big lie" and that Venezuela's social "wounds" were the result of the US economic "blockade". "Washington believes that [Venezuelan President] Nicolas Maduro should go. Washington's response is its distorted doctrine of regime change [in] democratic nations that do not like it when someone twists their arms and forcibly interferes into their internal affairs", she said. After opposition leader Juan Guaido proclaimed himself interim president of Venezuela on 23 January, Maduro called him a US "puppet" and accused Washington, which has stated that it has all options on the table with regard to a response to the Venezuelan crisis, of organising a coup in the Latin American country. The US and some of its allies have recognised Guaido as interim president, while Russia, China, Mexico and several other countries have said they recognise Maduro as Venezuela's only legitimate president.